This will be a short review, mainly because I recently heard that most folks don’t really care to read beer reviews. That’s okay, really it is. We started this site because we wanted a personal space to catalog the beers we liked and to be able to remember which ones we would buy again and it grew from there. So we still want to maintain a catalog of beers we’ve tried and what we thought about them. Feel free to ignore the reviews, well I guess it’s too late for that. Since you’re here you may as well go ahead and read about this one. This one comes in a 750 ml bottle with a corked top, beautiful hand drawn artwork on the label, and weighs in at 9% ABV. It pours a cloudy orange color with a healthy head. And tastes pretty fantastic. I could go into more detail but who cares. Bottom line is that I’ll buy it again. It’s the first Imperial Pilsner that I’ve ever had, (as far as I can remember) and I really enjoyed it. It’s a big 9% beer that tastes great alone and with food. I found this one at Baycrest Wine & Spirits in Costa Mesa, and will be looking for it again next time I head over there. It’s a year-round brew so will definitely be making it into my regular rotation. Four beer soaked caps from me. 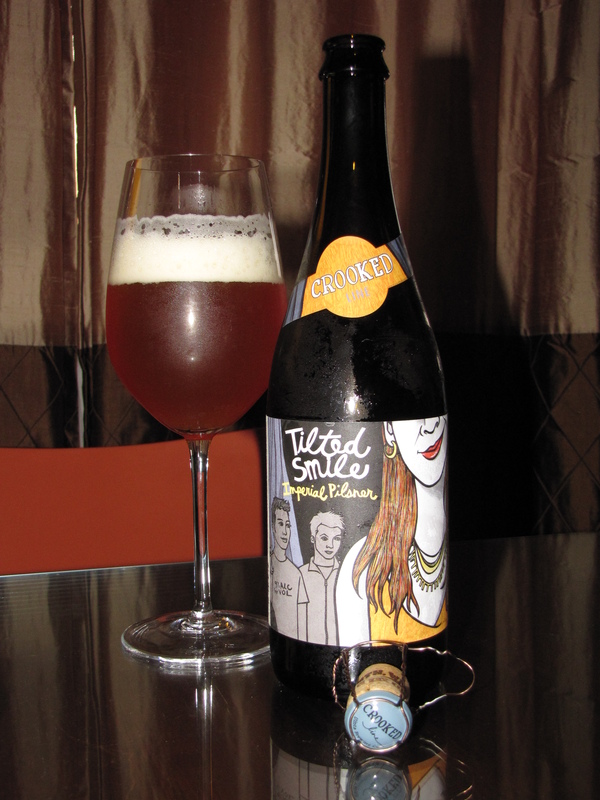 This entry was posted in Craft Brew, Imperial, Pilsner, Review and tagged 4 caps, 9%, Crooked Line, Imperial, Pilsner, Tilted Smile, Uinta Brewing by Erik. Bookmark the permalink. Hey Anthony, I guess even the hop heads need to switch it up every now and then. Glad to hear that you have been recommending this one to anyone who will listen. In fact, now that you mentioned it, I’ll have to pick up another bottle next time I’m out beer hunting. Been a while since I’ve enjoyed a Tilted Smile. Cheers!